Like everyone’s monolith, Earnest’s is complex and was once a little bit out of control. Earnest’s monolith is involved in all major aspects of the business. It is responsible for accepting loan applications from clients, making a decision for each of those applicants, and even supporting clients after loans have been signed. These wide-ranging responsibilities mean that the monolith is really five different applications in one body of code. Over 100 developers have contributed to its codebase since inception. The complexity of so many revisions and updates made it difficult to set up and maintain. Beyond standard npm libraries, almost a dozen different dependencies from a database to a mock SQS queue to a Hashicorp Vault instance needed to be set up correctly for it to work completely on a developer’s computer. Engineering teams had come to expect that getting this application set up on a new computer would take at least a week, and would require the assistance of multiple developers who had been at the company long enough to acquire the necessary tribal knowledge. As an engineering team, Earnest needed a way to ensure everyone had a consistent local environment. It needed to be quick and easy to set up. Finally, the local environment should have greater parity with the CI, staging, and production environments. In order to accomplish these objectives, I turned to Docker, Docker Compose, and The Go Script pattern. I started the solution by addressing the shared node_modules folder between all five applications. 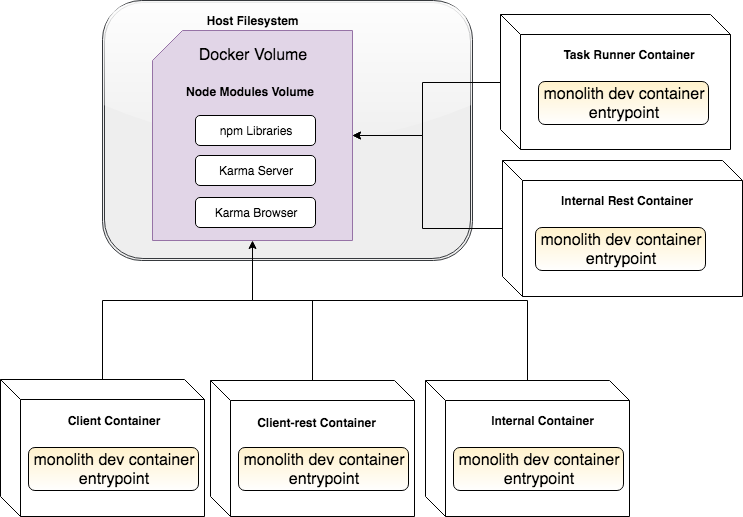 All application containers shared the same node_modules folder inside a Docker volume. Any of these containers could be started in any order and update the npm dependencies. Therefore it became necessary to ensure only one container could write to node_modules at a time. Here is the entrypoint script for each application container. So: the first time a user starts up the application containers, one of them will grab the lock and install the dependencies. The rest of the containers will wait for it to finish, see that the dependencies are valid before turning the control over to the grunt startup tasks. Dependencies are automatically checked and updated, but subsequent start ups will occur quickly and without calls to “npm install” until the dependencies change. In the event of a container shutdown, networking failure, or Docker daemon shutdown, the lock on the file descriptor is released automatically. 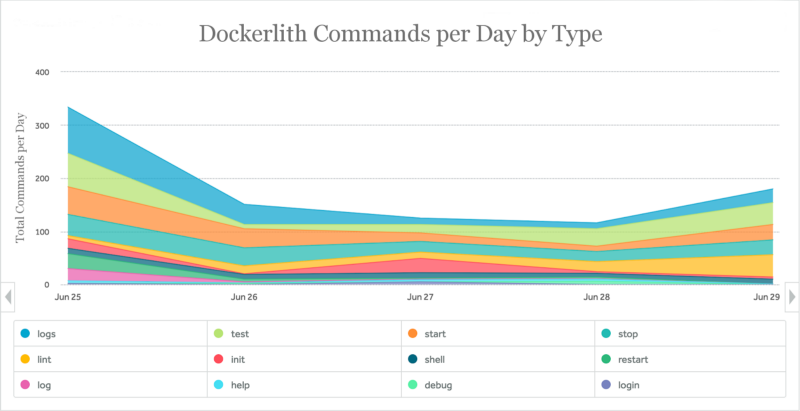 Developers can restart the Docker containers and continue with their workflow to recover from this unexpected failure. In addition to the container startup synchronization system, there is a Docker image that contains the correct versions of node, npm, and other programs. Docker Compose links the application containers, a Postgres container, a mock Amazon SQS queue, and other supporting containers. I have implemented The Go Script pattern as the last piece of the puzzle to make setting up the application, starting it, and running the tests one-step commands. This pattern is used by almost every project at Earnest, and it’s implementation in this project brings it in line with the rest of Earnest’s tooling. Developers new to the project can become productive quickly, and all developers can keep their focus on high-level goals instead of low-level implementation details. Accomplishing these goals was time-consuming and difficult, but worth it. Team morale improved as a longstanding pain point in the daily life of Earnest software developers was eliminated. Earnest’s software developers reported that this tool increased their efficiency by an average of 32.5% when working on the monolith. On an average workday, this tool is used around 200 times by the engineering team. This was originally a post on Earnest’s engineering blog, but has been cross posted to my blog as I am the original author and did the work described in the post.